Picture of the Dutch master of painting, Jan Vermeer Delft, “Love Letter”. The size of the painting is 44 x 38.5 cm, canvas, oil. This work of the Dutch painter is also known under the title “The Lady and Her Maid, Handing the Letter.” The impeccably arranged composition of the picture is somewhat mysterious. The foreground of the picture is a shaded room, on the left there is a map on the wall, on the right there is a chair, on it there are notes. Behind the curtain – the door to another, brightly lit room. In this room the maid brought a letter to a young woman sitting on a chair by the fireplace. The wall on the left is parallel to the view, on the right – perpendicular, that is, the entrance to the room is in the corner. Unusually, but possible. The curtain, standing on the threshold of slippers, broom – all this creates a kind of barrier between the viewer and the action, preserves the intimacy of what is happening and giving us a rare opportunity to peek the scene from someone else’s private life. 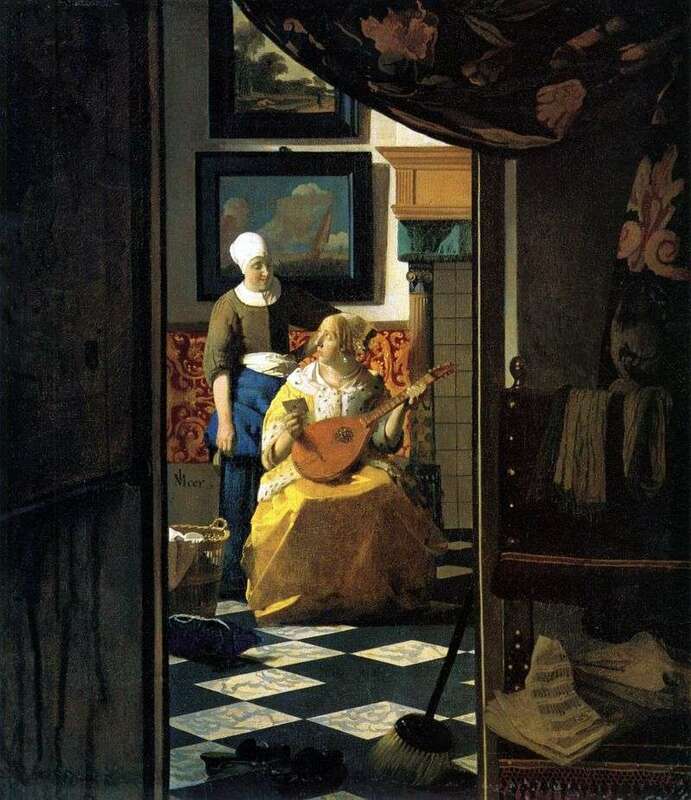 Narrative stories were typical for the early period of the artist’s creative work, but, having reached the full flowering of his talent, and apparently experiencing some creative crisis, Vermeer again turns to a kind of everyday history. The theme of the picture is a love letter, as well as interior items – a map on the wall, a broom, slippers on the threshold, zither – are traditional for a genre picture. A musical instrument, like the notes that lie on the chair in the right part of the picture, is a metaphor for harmony between lovers. The letter that the servant keeps is undoubtedly from the beloved, who is at this moment far from home – this is hinted at by the pictures behind the background. One depicts the edge of the forest in the style of Adrian van de Velde, the other – a ship in the sea. The expressions of the faces of the depicted women are interesting. The servant’s smile, when she looks at the seated hostess, shows her some superiority. The hostess is obviously surprised, she looks uncertainly up at the maid, her arrival almost frightened the woman. What kind of letter is this? Is it really the same thing that waited so long? Love experiences made the lady clearly neglect her duties – on the floor at the entrance to the room are abandoned slippers. A broom is thrown, on a chair there are notes in disorder. The laundry basket and the embroidery pillow are all left without attention. Description and meaning of the painting Love Letter by Jan Vermeer.